The structural properties of proteins that could eventually become important materials for manufacturing and medicine are revealed by a novel optical technique that works rapidly to sort through amino acid sequences even inside living bacteria, according to a team of engineers. "There remains an urgent need for fast and efficient techniques that can screen the properties of large numbers of protein sequences with minimal sample volume or in living cells," the researchers report online in the journal Analyst. Naturally occurring proteins like silk, collagen, wool and other natural fibers are a $40 billion industry. "There are 30 to 40 natural structural proteins that we know of," said Melik C. Demirel, Pierce Development Professor and professor of engineering science and mechanics, Penn State. "Silk is very strong, but when it's placed in water it loses its strength. Squid ring teeth proteins have similar properties, but because they evolved in a wet environment, don't have that problem." 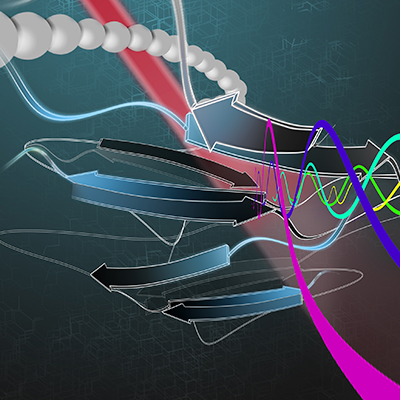 Finding variants of naturally occurring proteins with specific characteristics is only one approach. "The problem is when we look at mechanical properties there is an area where no natural materials have those properties," said Demirel. "Either nature did not create proteins with those characteristics or they disappeared." The proteins that interest Demirel and his team are both natural and synthetic. They are semicrystalline and the properties the team is looking for can be characterized by their crystalline structure, but crystalline structure changes as a material heats up. Standard flow cytometry lasers produce too much heat for this use.